Very well built, looks pretty smart with it's stainless steel finish, spacious. None to speak of. 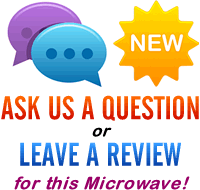 Looking to purchase a new mid sized combi microwave oven? The AC925EFY from DeLonghi may just be the solution - with a 25 litre capacity, 900w of power and a built in grill and oven. Measuring 31cm by 52cm by 50cm, it features a 31.5cm diameter glass turntable, complete with a stainless steel interior for easy cleaning. The exterior is also finished in the same stainless steel surrounding, and with a smart yet easy to use control system. The buttons are all clearly labelled, and the dial is easy to grip - overall our testers were positive about his model, finding it easy to operate. In terms of power, this appliance features a 900w output when in microwave mode, 1100w when using the grill, and 2500w when in convection oven mode, with a temperature range of between 150 and 240°C. 5 different microwave settings are included, complete with 10 auto cook options, which should be ample for the majority of users. We really liked this silver microwave - it works well, is simple to operate, well constructed and cleans easily - what more could you ask for? If you're after a cost effective combi microwave, then it is well worth looking at the AC925EFY microwave from DeLonghi - it works very well, is reasonably priced, and is built to last. 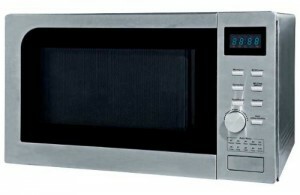 Microwave total power output 900 watts. Grill power output of 1100 watts. Convection oven power output of 2500 watts. Fan assisted convection oven with a temperature range 150 to 240°C. Interior capacity of 25 litres. Stainless steel exterior and interior lining. Microwave and grill can be used simultaneously. 10 auto cook settings built in.